Whether you are completely new to hotel Facebook marketing, an intermediate level platform user or a seasoned expert, there are always ways to improve your results. In this in-depth article, we aim to provide you with some insight into the different tools available and what’s possible within your given budget range. Why Is Hotel Facebook Marketing Important? Facebook users typically spend over 50 minutes per day on the network, including Messenger and Instagram. In the US and Canada, Facebook’s reported user base is 184 million people. This is roughly 51% of the entire living population. 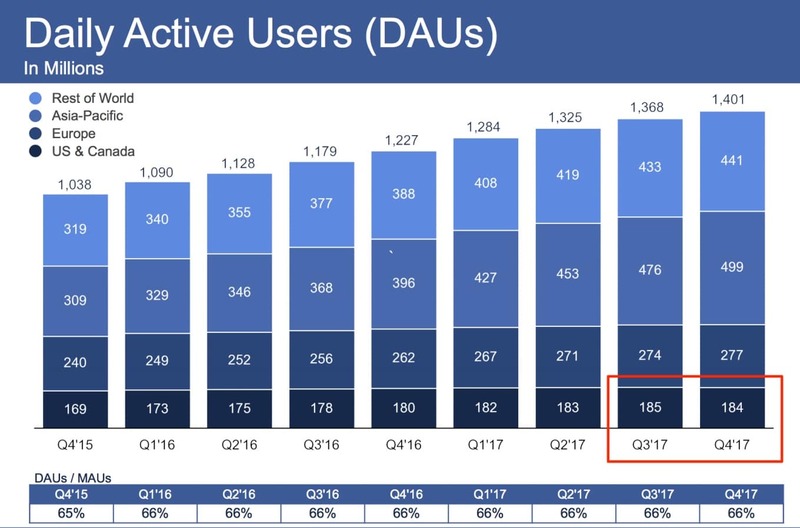 Whilst there are signs growth is slowing in the US & Canada, overall numbers of daily active users (DAU’s) are growing worldwide. When it comes to travel, some studies claim that up to 95% of Facebook users use Facebook for travel-related activities prior to going on vacation. When you consider the volume of travel photos shared by your own friends and family on Facebook and Instagram, it is unsurprising that the platform is a source of inspiration. So, as the marketing maxim goes, if you want to be where your customers are then Facebook can’t be ignored. The question is, instead, how much time and money are you going to put into it? I have little time and even less budget, what’s the bare minimum? Does Your Hotel Facebook Marketing Meet Your Standards? I have less than $5000 per year to work with, show me the DIY approach. I take this seriously, have a decent annual budget and want to excel. It’s inevitable. You’re going to have to look at Facebook sometime, even if you don’t want to. Because it’s not up to you whether or not a page representing your hotel is created on Facebook. As soon as an active user wants to tell their friends and family they are enjoying a cocktail at your hotel bar and they share their location, you’ll likely end up with a user generated page. Search Facebook for your hotel name and check out any pages associated with it. Follow the instructions here for how to claim that page. Repeat steps 1-2 for your bar/restaurant/activity provider and claim those that belong to you too. Now you have control of the channel and you get to choose how to manage your hotel Facebook marketing, not someone else. Once you have established control, the next free thing you can do to set yourself up for success is to use the hotel Facebook marketing tools available to your hotel that are designed for the purpose. Facebook Business Manager is what you need. It will help you keep your assets in one place and provide an interface to keep your personal life separate from your hotel. Make sure you have a personal Facebook account. Go to business.facebook.com and create an account for your hotel. Follow the remaining instructions here to add your Facebook pages and Instagram account (if you have one) into one place and decide who should have access. Explore some of the analytics tools available if you have time. Now your data, access control and hotel business information is in one place, separate from your personal life and easy to hand over to someone else if you need to. 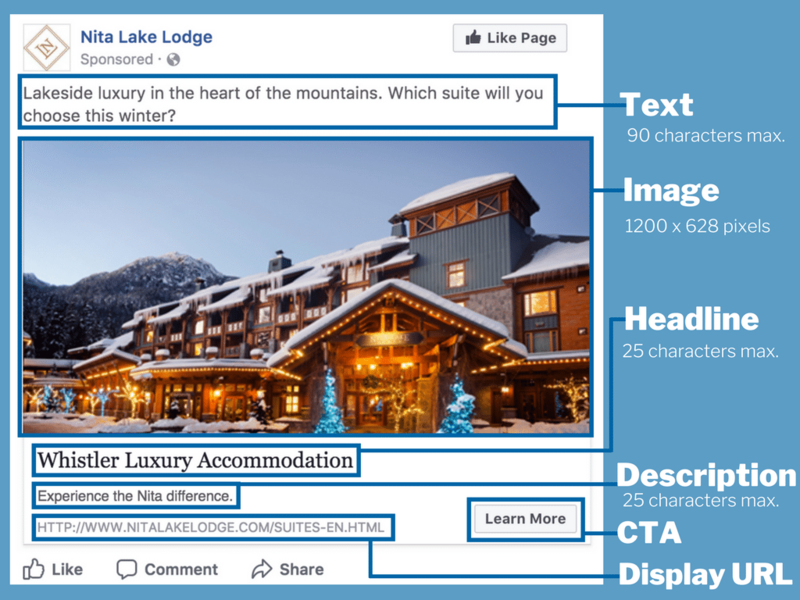 Does Facebook Marketing Meet Your Hotel’s Standards? Your hotel likely has a hotel marketing strategy to guide you. Ideally, it has a hotel marketing plan that matches your budget to your strategy and takes the stress out of the day-to-day decision of what to do next. Typically, there will also be another document that will help define your hotel Facebook marketing, your hotel brand guidelines. Use this document and your knowledge of your hotel’s operations to check that your Facebook and Instagram profiles meet your standards. Create a profile photo and a cover photo for Facebook that meet the size requirements. You can use the same profile photo for Instagram. Go to your hotel Facebook page or Instagram profile and upload these to the respective areas. Check that your hotel’s address, phone number, email address and other information is correct. If you want visitors to take a particular action (e.g. 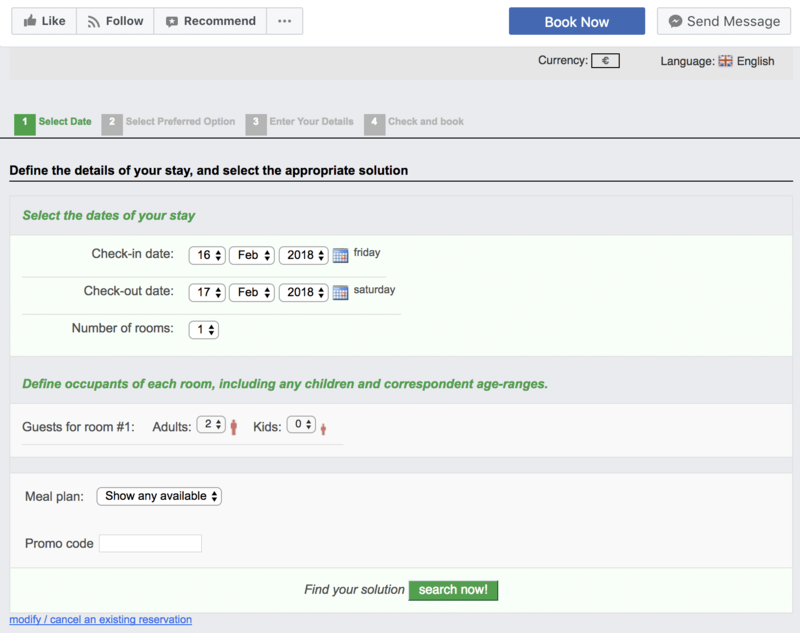 make a phone call for a booking) then consider adding a call-to-action button to your page. Congratulations, you now have a simple, free page that will act like a business directory listing. You are not obliged to post anything to your page now but you may choose to in future. If you do, here are some boutique hotel social media post ideas. Your hotel guests may want to communicate with you or write a review of your hotel on Facebook. Given that there are a myriad of other hotel review websites out there to manage, such as TripAdvisor, you may decide to disable reviews on Facebook. However, there are benefits to enabling this option and managing reviews in accordance with your hotel policy. In addition to being a source of authentic information for your prospective guests, the rating from these reviews shows in search engine results pages (SERPs). This extra real estate in the SERP is a space not occupied by Booking.com, Expedia or another OTA, and it provides further social proof of your hotel offer. Enable reviews for your hotel Facebook page. Enable notifications to alert you when a new review is posted. One of the main pillars of the Facebook empire is Messenger. It is becoming an increasingly important aspect of hotel Facebook marketing because it can be used for customer service and sales through real dialogue with guests. Use of the service is free. If you absolutely, positively do not have time for communicating with guests then you can turn off messaging for your page. However, in doing so you lose the potential benefits. To set up this feature, follow the instructions here. Well done, you’ve completed the 5 steps required for zero budget hotel Facebook marketing! Your hotel Facebook page looks good, both in terms of the artwork included and the vanity metric of Facebook likes. However, you’ve got a well-founded suspicion that a minimal percentage of the people that have outwardly displayed affection on Facebook for your hotel actually see what you publish. So, what’s the point in publishing at all when Facebook have effectively announced the final nail in the coffin of organic reach? Here’s the thing. There’s a strong argument not to publish at all unless you are actively paying to have that message promoted. However, to get the best results for your advertising budget, there are a few things to do first. Before we get to Facebook advertising, it’s worth addressing the argument that you should stop all unpaid social media activity. The point is not that it should stop but rather that it should have purpose and the costs involved should be accounted for. So what’s the cost of keeping Facebook, Instagram and whatever other social media channels you choose to be present on alive? We’ve already discussed the bare minimum required to use Facebook as a directory listing. The costs involved for doing anything else that is ostensibly “free” also need to be taken into account and weighed against the real option of outsourcing that work to a reputable firm. You may already be spending the first part of your Facebook marketing budget without even realising it. Alone, Facebook is an island that tries to keep users from leaving. This has minimal benefit to many businesses, particularly those that have a purchase process as complex as a hotel booking. Realistically, how many bookings come through your awkward Facebook plugin? Thankfully, you have the best tool for the job already. Your hotel website. Which, if your developer is good, will be fast to load, secure and meet hotel SEO best practices. 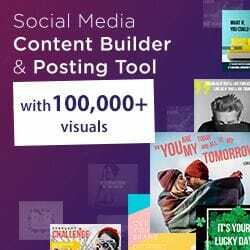 There is a Facebook tool that (among other uses) gives you the ability to track the activities of your website visitors and more selectively advertise to them. It works by loading a single pixel on each page of your website so the effects on page load speed are minimal. Installing a Facebook pixel on your hotel website is simple. Follow the instructions here. Once installed and firing, go to your Facebook Business Manager and open the Analytics tool for your pixel. This will start the process of data collection and is a tool worth exploring in its own right. The work you have already done in getting your Facebook page this far is of great value to your future as a hotel Facebook marketer. It simply needs to be organised so that you can reap the benefits without too much extra work. This means building audiences that reflect some level of qualification as a guest of your hotel. In time, you or your Facebook advertising agency partner will test each one and learn the most effective methods of advertising to each. There are numerous ways in which to build audiences. We’ll cover the basic ones here and explore custom audiences in the more advanced section below. The aim is to create a baseline set of audiences that will be saved in your Facebook Business Manager. The following are typically the most broad audiences you may choose to advertise to. Large, addressable, qualified audiences (LAQA) are typically the cheapest to reach because when we advertise we are bidding on inventory (space on screens in front of our audience members’ eyes,) larger audiences offer more available ad inventory than smaller ones. There are 5 basic ways to qualify your audience. If you use personas in your hotel marketing strategy then you may decide to combine some of these attributes to match your personas as closely as possible and name them in line with your strategy. 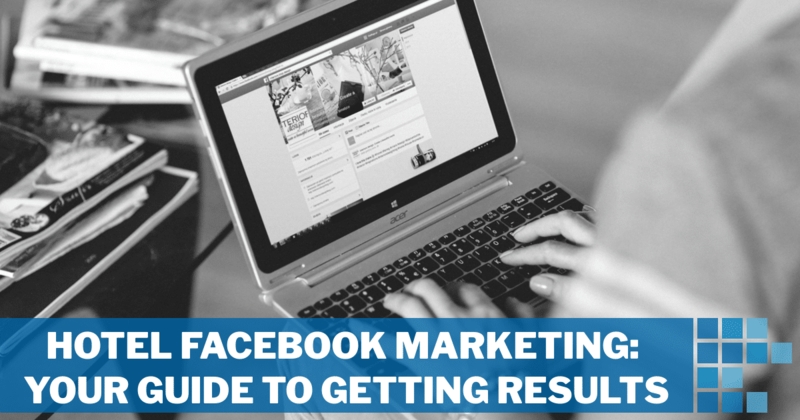 The tool you need is Facebook Audience Insights. Note that given the data that Facebook collects renders it as both ‘data controller’ and/or ‘data processor’ (dependent on the area of activity) under GDPR and other international privacy laws, some targeting methods may be different or not available depending on the geographical location of you and your audience. Is your hotel primarily visited by people from a certain location? For example, do you run a small hotel in the Hamptons that draws primarily from the NYC area? Or perhaps the vast majority of the guests at your hotel in Val d’Isere are from the UK? Does your hotel target a particular age group? Gender? College graduates? Married couples? Dependent on your location, Facebook offers a range of demographic attributes to choose from. What are your guests’ hobbies? Do they visit your hotel for a particular activity? Are you looking for soccer players, knitting enthusiasts or backcountry skiers? Are there particular destinations that fall within your competitive set that may provide the key to targeting the right type of people? Is there a behaviour that unites your target market? For example, are they more inclined to use a particular device? Until recently, further behavioural audiences were available from third parties but Facebook has now removed this option in light of abuse. Who is already connected with your brand? Do you want to reach these people, who have an established affinity for your hotel? Or, do you want to specifically exclude them with a view to finding new people to (for example) like your page? One of the best ways to learn with a limited budget is to try the different options available to you. Facebook provides an option in Ads Manager entitled ‘Guided Creation‘ that simplifies the process for creating ads on the platform. Facebook and Instagram are tools for the hotel marketer to explore. However, they are only part of an effective marketing strategy. 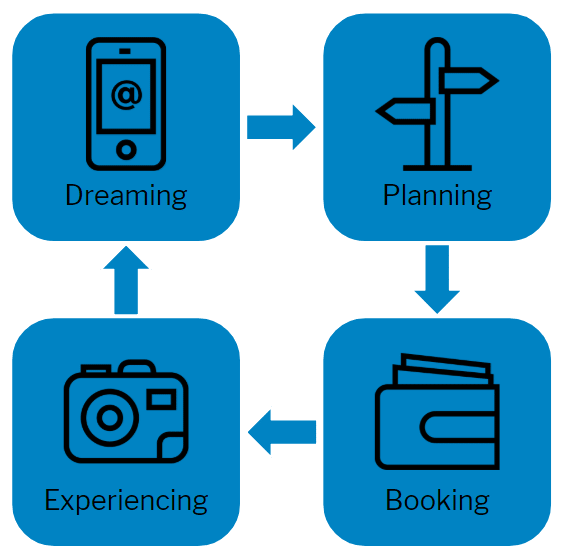 It is important to understand where they sit in the context of the travel consumer journey and that other tactics should be employed to complement them. Any regular user of the platforms will likely have experienced a friend or relative sharing their travel experiences. For some people, this can be a trigger for the ‘dreaming’ phase. It’s telling that Facebook recently announced a targeting option based on this broad behaviour, known as trip consideration. The hotel marketer with a good understanding of their guest’s booking journey is already most of the way towards getting the most our of their Facebook and Instagram advertising spend. Based on this understanding, we can develop a booking funnel strategy that delivers the right message to the right person at the right time. The key to getting this right is identifying and tracking actions that signal booking intent. When done properly, this offers the opportunity to create audiences that reflect each stage and develop/test messages to them accordingly. Cold – this audience has demonstrated no discernible interest in the offer. It is the cheapest to reach because it is a large group of people. Efforts can be made (as described in an earlier section) to include some element of qualification based on the targeting methods available. This could include lookalike audiences based on higher level audiences. Engagement – this audience is comprised of everyone who has demonstrated some level of engagement with the hotel. It could include custom audiences based on people who have engaged with content on the hotel’s Instagram channel, Facebook fans or website visitors. View Content – by contrast to level 2, this audience only includes those who have demonstrated a clear interest in the bookable products/services available on the hotel website. A tool such as Google Tag Manager can be used to manage which pages send the relevant pixel events to Facebook. Add To Cart – once the website user has viewed content (such as a room type or spa service,) our next level of purchase intent is to group those that add the item to a shopping cart or view more details regarding dates, price and availability. Purchase – the strongest signal of intent, having actually completed a purchase/booking. This audience is especially useful as one to exclude from ad targeting in order to avoid spending money advertising to those that have purchased from you recently. In some instances, Facebook audiences based on this structure will be too small to use effectively. In that case, audiences can be combined (e.g. levels 3 and 4 together) in order to create a useable grouping. This structure helps avoid one of the most common mistakes made in Facebook and Instagram marketing – sales messaging aimed at a cold audience. For each level of the booking funnel, our aim is not to jump direct to purchase but rather to advance the user to the next stage. The choice of creative and copy for ads should reflect this at each level. This video from Moz is another good resource on this topic. Installing the basic Facebook pixel is the first step towards a more effective advertising strategy. However, there are a number of other features that can be used to ensure your booking funnel is reporting correctly to Facebook Analytics, your audiences are accurate and your strategy is powerful. The Facebook pixel comes pre-loaded with a number of standard events for use with custom audience or conversion events that you choose to track. The data that may be gathered is useful in the analysis of user behaviour, building custom audiences for your booking funnel and prioritising certain users for advertising. The ViewContent event is useful for passing information on exactly which products/services your website user is interested in. It is essential for implementing a dynamic product advertising campaign, explained below. The value parameter (available in a number of event types) allows you to pass information to Facebook that gives insight on how much the anticipated purchase is worth. This is especially useful when deciding how much to spend on advertising to certain audiences. CompleteRegistration can be used for events other than a booking transaction. This may be relevant for hotel marketers running campaign with the objective of building email newsletter lists. The full list of all 9 standard events and information on using custom events can be found here. The Facebook pixel typically needs the website user to be logged-in to Facebook on the same browser and device that they are visiting the website from. However, this is not always the case (e.g. booking a hotel from a work computer). In instances where it is helpful to track users from the personal information they willingly submit on your hotel website, advanced matching allows for the secure passing of data from your website to Facebook where an algorithm matches it to their user profile. In the Advanced Matching process, the result is a more comprehensive and accurate ‘Purchase’ audience in your booking funnel. This can help improve targeting of future guests by creating lookalike audiences based on those people that actually booked and avoid wasted ad spend by excluding those that have already purchased from seeing your future ads. Remarketing (sometimes referred to as ‘retargeting’) is not a new concept but the implementation of the method through Facebook dynamic product ads is proven to be more effective than other techniques. It relies on the correct setup of the ViewContent event for the Facebook pixel on your hotel website. The premise is simple. A user visits the page of a particular product/service on your website and is later served an ad for the same product/service while browsing Facebook, Instagram or a website carrying ads from the network. Successful implementation requires a well structured website and works best when purchase events are also accurately tracked so that users are not served ads for items they have already recently purchased. Despite sharing the ‘dynamic’ moniker Facebook Dynamic Creative ads are distinctly different to Facebook Dynamic Product Ads. Dynamic product ads require tracking of an individual user and their website browsing behaviour whereas dynamic creative ads are better suited to campaigns that will deliver to many thousands of viewers. Dynamic creative ads use conversion information to adjust the configuration of the ad to best suit the audience and optimise for the most conversions. We originally wrote about this on release of the feature in 2017. Ad campaigns that use this method also show lower signs of ad fatigue. This is likely because multiple impressions on the same user are typically not showing the same configuration of assets. Technically speaking, it is the ‘same’ ad that they see but the altered combination of text and photo/video means they are less likely to ignore it on the basis they have seen it before. In the world of hotel digital marketing, attribution can be key to making sure your efforts are noticed by senior managers. The allure of a direct, tangible link between advertising expenditure and business revenue is irresistible. The easier it is for non marketing professionals to understand, the better. That’s why Facebook’s offline conversions tool can be of extra benefit to hotel marketers. Imagine that a prospective guest may engage with a Facebook or Instagram advert for a hotel destination on a mobile device, only to later search for the same hotel using a desktop computer at home or at work. In fact, there may be many other digital touch points prior to making the booking. Moreover, the purchase may be on the hotel website, through an intermediary, via phone or some other method. Regardless, the impact of the ad is lost amidst the lack of cross-device tracking. Manually uploading transaction data from a CSV file. Using advanced matching with the Facebook pixel. Using the offline conversions API in conjunction with a third party service such as a CRM. The tool provides attribution feedback for a given time window so you can see if your Facebook and Instagram advertising is having a real world effect not tracked elsewhere. This information can be used to assess the effectiveness of a campaign and is a good tool for helping decide whether ongoing investment in advertising on the platform is a good move. When provided with transaction value, it can be as good as other major online advertising platforms at providing ROI scores. Ultimately, Facebook advertising does not sit in a vacuum. There are real business goals to be achieved behind the use of this tool and the various tactics for combining its features. Expert level marketers understand this. Most hotel general managers care very little for the detail of the marketing mechanisms when there are more impactful indicators to focus on, such as profit. Profit is the difference between upgrading the hotel bathrooms next year or not. Profit is the difference between hiring your favourite photographer for next year’s group sales campaign or not. Profit is the difference between getting a raise and a promotion or looking for a job elsewhere. By allowing your business systems (e.g. booking engine) to ‘converse’ directly with your advertising system, there is potential to focus on the more human, creative elements of marketing. In doing so, you can rise above the detail and focus on impactful business goals. Are you using the tools available to you to the extent that is best suited for your hotel and advertising budget? If you’re interested in learning more about the features described and how it can work for you, get in touch.